The AP-134 and AP-135 indoor 802.11n access points (APs) maximize performance for mobile devices in extremely high-density Wi-Fi environments and ensure strong threat protection using integrated MACSec* security. 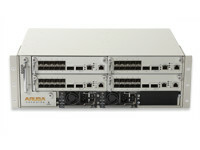 These multifunctional APs deliver wire-like performance at data rates up to 450 Mbps per radio. Taking advantage of 802.11n technology, the AP-134 and AP-135 employ three spatial streams to deliver 50% more throughput and support 50% more mobile devices in high-density environments compared to previous-generation APs. 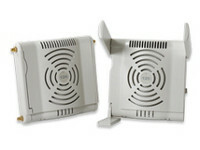 The AP-134 features two 3×3 MIMO dual-band 2.4-GHz/5-GHz radios with external antenna interfaces, while the AP-135 features the same radios with internal antennas. Both are built to provide years of trouble-free operation and are backed by a limited lifetime warranty. MACSec authentication and encryption on Ethernet ports enable secure AP deployment by interoperating with the MACSec capability on Aruba Mobility Access Switches and other wiring closet devices. The AP-134 and AP-135 feature dual 10/100/1000BASE-T Ethernet interfaces and operate from standard 802.3af and 802.3at power-over-Ethernet (PoE) sources. The secondary Ethernet interface (active only when supplying 802.3at PoE or DC power to the access point) enables secure authorized backhaul for wired network-attached devices. Working with Aruba’s line of centralized Mobility Controllers, the AP-134 and AP-135 deliver secure, high-speed network services that move users to a “wireless where possible, wired where necessary” network access model. The network can then be rightsized by eliminating unused Ethernet switch ports and thereby reducing operating costs. The key to ensuring wire-like performance and reliability is Aruba’s unique Adaptive Radio Management and spectrum analysis capabilities, which manage the 2.4-GHz and 5-GHz radio bands to deliver maximum client performance while mitigating any RF interference. 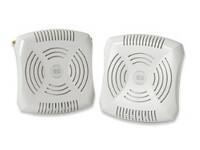 The multifunction AP-134 and AP-135 can be configured through the Mobility Controller to provide WLAN access with part-time air monitoring for wireless IPS and spectrum analysis. 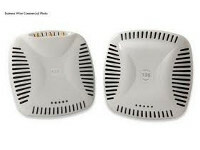 They can be configured as dedicated air monitors within the campus WLAN or can be remotely located. They can enable wireless mesh networking for high performance network backhaul where wired cabling is not available. 802.11n indoor APs designed to support maximum performance for maximum client density, with maximum deployment flexibility and security. • Spectrum analysis scans the 2.4-GHz and 5-GHz radio bands to provide increased visibility into non-802.11n RF interference sources and their effect on 802.11n channel quality.